In September 1952, vice presidential candidate Richard Nixon was accused of taking money from a reelection fund. In a live television address, Nixon painted himself as a humble family man who had only accepted a single gift  Checkers, the family dog. The "Checkers Speech" saved his candidacy and helped propel Dwight Eisenhower to the presidency. You'd think he would have learned his lesson. Twenty years later, though, President Nixon's staffers formed the "White House Plumbers," a secret unit tasked with digging up dirt on Pentagon Papers leaker Daniel Ellsberg. The Plumbers went on to commit crimes for the Committee for the Re-Election of the President, including the Watergate burglaries. Although Nixon denied knowledge of the Plumbers activities, tapes subpoenaed during the Watergate investigation revealed years of political espionage and illegal surveillance. 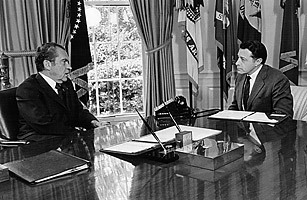 The "Smoking Gun" tape revealed that Nixon was involved in the cover up. On August 8, 1974, Nixon became the only American president to resign the office.